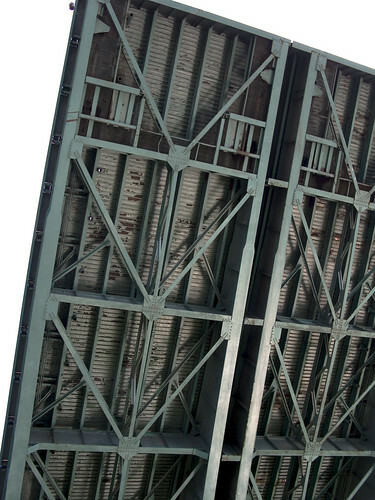 A structure only a mother could love, the pugnacious span is also known as the J.J. Byrne Memorial Bridge. 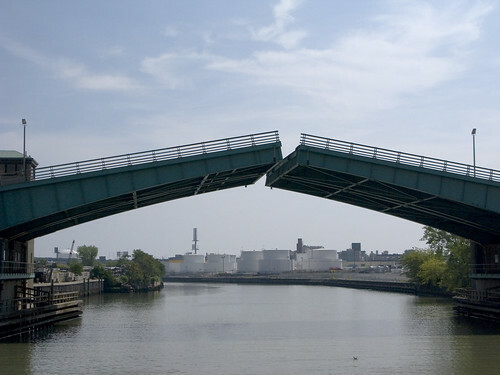 Viewed from the street 0n Review Avenue, the Greenpoint avenue Bridge spans the Newtown Creek from Long Island City, Queens to Greenpoint, Brooklyn. In Queens, Greenpoint avenue passes by Calvary Cemetery and changes its name to Roosevelt Avenue after it crosses Queens Blvd. In Brooklyn, it remains Greenpoint Ave. all the way to the East River. If it continued across the East River, it would intersect Manhattan at (the nonexistent) corner of 19th street and Avenue D. It’s 2.2 kilometers, or 1.37 miles from the mouth of the Newtown Creek at Hunters Point. On September 18th of 2004, the Newtown Creek Alliance and the Working Harbor Committee joined forces and chartered a cruise up the Newtown Creek. Onboard was a heterogeneous collection of experts. Amongst their number were scholars, researchers, photographers, environmentalists, historians- even the pale enthusiast know as the Hermetic Hungarian was present. This is an annual event, and we are just weeks away from the 2009 trip. 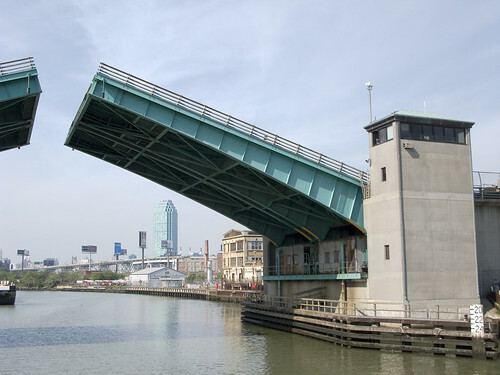 Prior arrangements ensured that the drawbridges of Newtown Creek would open for us, and the redoubtable bridge operator performed his craft admirably. 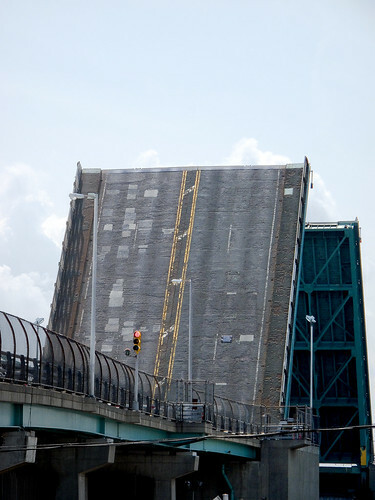 The Blissville Bridge was built in 1850, (and as an advertising freelancer- I can relate to this) and William H. McDonough, a civil engineer, had encountered difficulties getting paid by the folks on the Queens side after the job was done. Neziah Bliss is the fellow for whom the surrounding community on the Queens side was named (part of this community was razed and became Calvary Cemetery) and the man credited with building it. A shipbuilder from Greenpoint, Bliss had married into the Meserole family and had aspirations of greatness. He established ferry service to Manhattan from Greenpoint, bought up the Queens side of the Newtown Creek, created Franklin Avenue as a turnpike, and had the Blissville Bridge built to extend Greenpoint Avenue into Queens. Bliss was a self made man who left his native Connecticut at the tender age of 20. His fortune was assured when he made the acquaintance of the accomplished steam engineer, Robert Fulton. Through professional association with the older man, Bliss soon felt confident to start his own career. Of course, Forgotten-NY has been everywhere, everythere, and everyhere. The first bridge on this site, a drawbridge known as the Blissville, was built in the 1850’s. 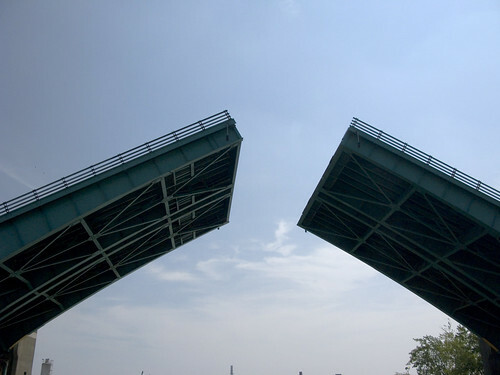 It was succeeded by three other bridges before a new one was completed in March 1900 at a cost of $58,519. That bridge received extensive repairs after a fire in 1919 damaged parts of the center pier fender, the southerly abutment, and the superstructure. Until that time, the bridge had also carried tracks of the Long Island Rail Road. The current bridge was built in 1987. Bliss traveled the national circuit as a consultant on the dangerous and vital new technology of steam, making many industrialist friends, including future presidents. In 1827, Bliss returned to New York City and worked at the Novelty Iron works in Manhattan on East 12th street on the East River. Makers of maritime engines, he enjoyed great success, and coveted both Greenpoint and the Newtown Creek from his offices. He would do it better, creating a planned community of neat streets and open skylines, utterly unlike the smokey and dark alleys of industrial Manhattan. 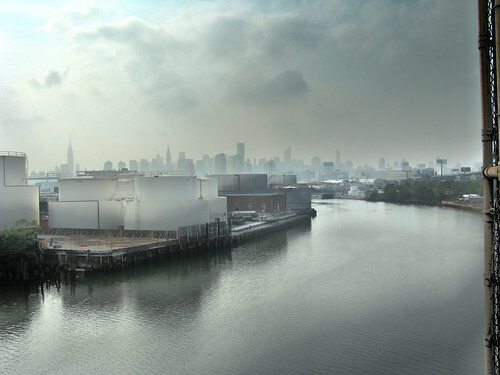 Bliss lobbied the U.S. Navy to move the Brooklyn Navy Yard to Newtown Creek, but his failure to convince the admirals only set him to resolute and magnified ambitions. He established a shipyard in Greenpoint, and had enjoyed considerable success. 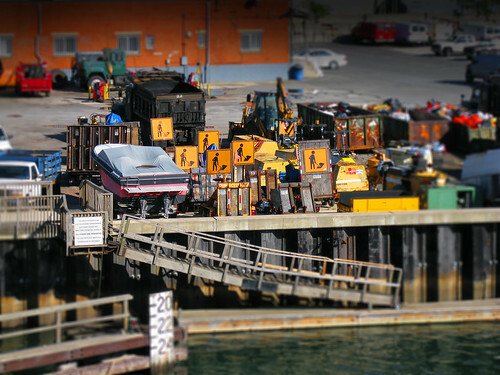 Enough to expand his operations along the Newtown Creek, and to set up a transportation network to bring in supplies. It was during the land transactions securing the real estate for these expanded works that he met Mary A. Meserole. Marrying into the ancient Meserole clan gave him social status and political access. He soon redesigned Greenpoint and with a partner- the President of Union College– Eliaphalet Nott, founded Blissville on the utopian model of a planned industrial community. S. Berliner the III has an excellent LIRR site here, with maps of the LIRR tacks that once crossed here. In 1926, J.J. Byrne worked for Joseph A. Guider, Borough President of Brooklyn. In 1926, the Borough Presidents held a vote on the New York City Board of Estimate, giving their political machines an effective stranglehold on the allocation of funds to municipal projects. A delicately balanced political machine, this grand experiment called the City of Greater New York spread a lot of money around the boroughs in those early days, just to keep everyone happy with the new arrangement. Don’t forget, the B.P would have been the Mayor of Brooklyn, or Queens were it not for the consolidation. Gatekeepers to a flood of city money designated to build jails and firehouses and bridges, and all sorts of public buildings – especially schools, courthouses, and hospitals- that could be sited in favored alderman’s wards- the Borough Presidents became important and powerful men. Their political organizations extended from the street corner to City Hall and all the way to Albany. Not implying, exactly, that Guider and Byrne were bad guys, or exemplars of corruption- but they ran BROOKLYN in the 1920’s. BROOKLYN. Guider was a democrat, as was Byrne. Guider had previously represented Brooklyn’s 11th district in the New York State Assembly from 1896-1900- serving during the Greater New York consolidation efforts. By 1922, he was the Public Works Commissioner of Brooklyn during the reign of B.P. Edward Riegelman, and commanded the princely salary of $7,500 a year as compensation. Elected in 1925 as Borough President, Joseph A. Guider is remembered for civil building projects, playing a role in the founding of what would become Brooklyn College, and keeping the Brooklyn Bridge toll free for Bicycles. The future Mayor Jimmy Walker eulogized him as “a conscientious and useful public servant’. He’s also remembered for dying in office. Borough President Guider died midterm in 1926 from a burst appendix at 1:30 AM on September 22, 1926 at the Skene Sanitarium of 759 President Street, so the Brooklyn Commissioner of Public Works- J.J. Byrne– was naturally the first choice for succession by the Aldermen. Byrne was a Brooklyn native, a son of immigrants who hailed from “Irishtown” near the modern Brooklyn Navy Yard. He finished grammar school, but went no further, and was reknowned for his trained singing voice. J.J. Byrne completed the term of Guider, and was reelected in 1929 as B.P. in his own right. Byrne is remembered as having extended both the sewer system and the number of Brooklyn Libraries, and for pushing along several long municipal boondoggle projects on the Tammany list- such as the Central Courts Building . 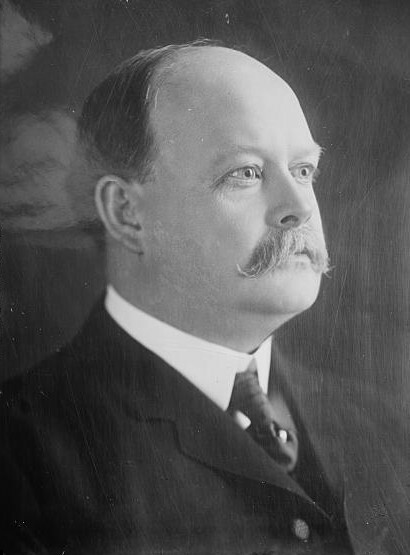 Borough President J.J. Byrne died in office as well- in 1930. Doctors report his death as being caused by a failure of function in the kidneys. Guider and Byrne were both creatures of the notorious Brooklyn Democratic Party Boss John H. McCooey. J.J. Byrne was McCooey’s Brother in Law. McCoeey was known as “Tammany’s Uncle John, in Brooklyn”. John H. McCooey – photo from wikipedia. This is another one of him throwing out the first pitch of the 1932 season. He was appointed chief clerk of the Bureau of Public Buildings (1907-08) and later Brooklyn Commissioner of Public Works (1924-26). When Borough President Joseph A. Guider died in office in September 1926, Byrne was selected to complete the term. He was elected in 1929. 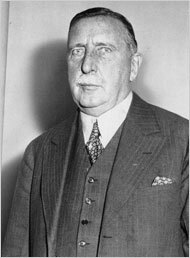 Byrne died in office on March 14, 1930, after a period of declining health. His wife’s brother-in-law was John H. McCooey, Democratic Leader of Kings County. 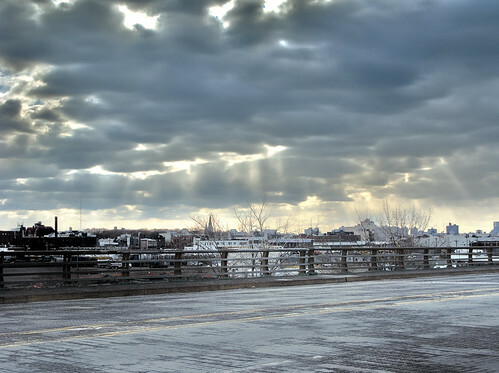 Mayor Michael Bloomberg recently announced his intentions to devote $6 million of New York’s share of the Federal Stimulus Package funds to repair and rehabilitate the Bridge. In 1919, it would have been the place to watch and later participate in a spectacular and auspicious conflagration at Standard Oil. This structure was constructed in 1987, replacing the 1900 model which was damaged by a different fire and partially rebuilt under the administrations of Guider and Byrne. 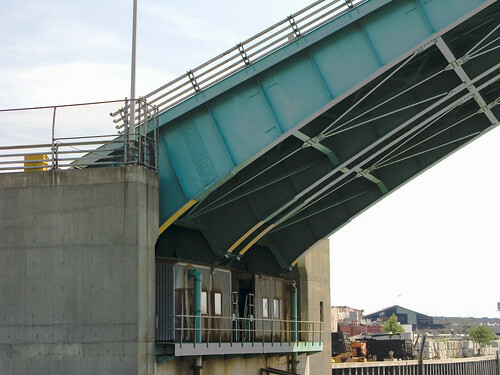 In 1922, there was debate over whether the Blissville Bridge should be replaced by a tunnel under Newtown Creek, but the prohibitive cost made a bridge seem the best choice..
From the water, one can observe the intricate works of the lift mechanisms. Gargantuan, they suggest the handiwork of some storied cyclops trying to please his half lame master. The double-leaf trunnion bascule design, precisely euclidean in design and inspired function, is powered by gargantuan electrical motors. 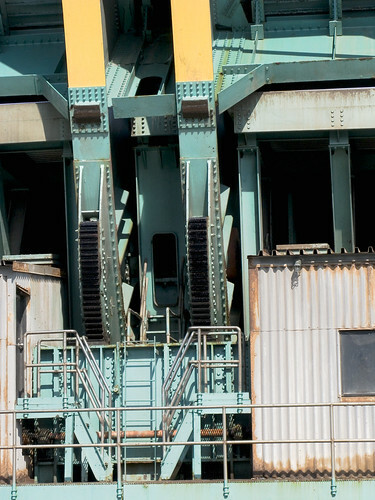 Activated by a manned post, the structure is actually quite active but a shadow of its former self, as ship traffic on the Newtown Creek once exceeded that of the Mississippi. 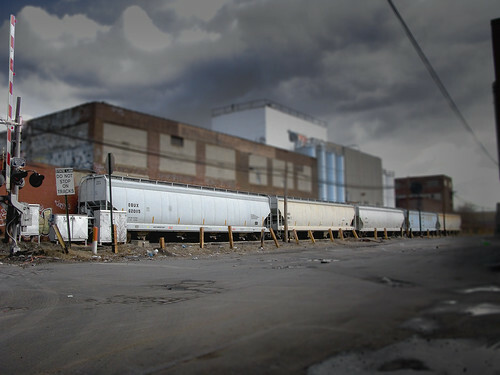 The areas of Greenpoint and Long Island City touched by the Bridge are odd and lonely places. In Brooklyn, there is the Newtown Creek Sewage Treatment Plant and the Miller Building. 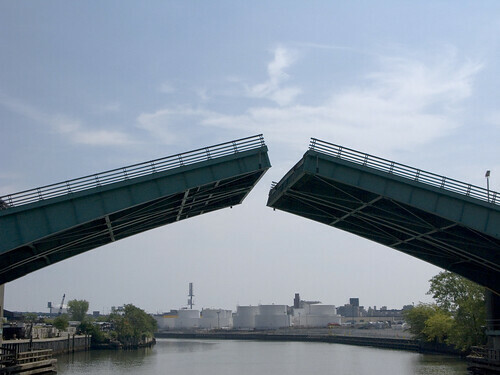 If one walks down to the end of the bridge and turns right on Greenpoint Avenue, they shall find themselves in an isolated and dark spot over a particularly dirty bend in the path of the Newtown Creek. Its deserted and a little scary down there, so a left onto Kingsland Avenue will take you past the Oil Spill remediation efforts Exxon diligently shepherds. On the Long Island City side, Review Avenue takes you to venerable Calvary, and Greenpoint Avenue out to bucolic Sunnyside, and Van Dam to the frenetic Queens Plaza. But- there are two service roads on the Long Island City side, that lead down to the water. Both are labeled Greenpoint Avenue. A small drawbridge across the English Kills, with horrible surfaces. The roadway is a grating, and the sidewalk is some nasty broken-up rubber. No stairs, though. As I’m wont to remind you, dear readers, bring ID with you when you go to these places. By NY State law, you must produce ID when requested by a Policeman. I mention this, because despite the abyssmal, and possibly prosecutable laxity of security in this area- this is a pretty vital area and you SHOULD be challenged by security in this place. Also, ID may help to identify your body if you are not extremely careful of trucks and trains down here, or if some other remnant of New York’s past finds you out. Your biggest hassle may come from the guys working on their cars, or from hired security at the fencelines. Both of the Greenpoint avenues terminate on Railroad Avenue. There’s some cool 19th century stuff down the street, especially where the pavement stops, but I was uncertain of whether I was trespassing or not so I turned back in accordance with my inner timidity. The road vestigially follows the tracks for a few hundred yards and it appears on many old maps. 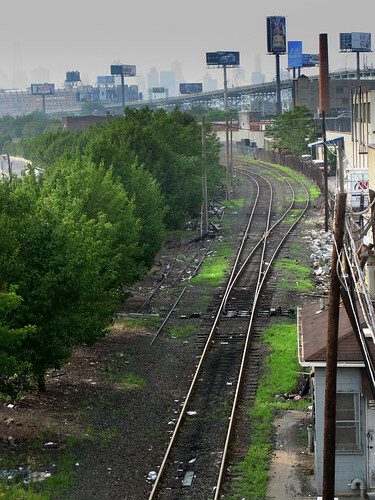 On the west side, LIRR tracks, at grade level, weave tenebrously toward Manhattan. That’s the LIRR Bliss tower in the lower right. On the East, storage for street signs. To the south, the spires of Greenpoint. In general, I absolutely love this blog. In fact, its beautiful photography and lucious descriptiveness inspired me to go on a walk through the area myself this past weekend. However, I’m continually aggrivated by your continual assertion that these places are somehow preternaturally dangerous. They’re no more (or less) dangerous than any other industrial area. This weekend, I walked from the Hunterspoint Ave. 7 stop, to the LIC LIRR, then down Borden (following the bridge detour back to Hunterspoint), then down Review to Calvary, through Calvary to Greenpoint Ave., then back up to Hunterspoint to Van Dam, following that back up to Queens Blvd. Do you know what I saw? Generally, nothing. A few people going about their business. A few cars and trucks booking down Review Ave. at breakneck speeds. (But hey! There’s a sidewalk there! Most people I know — even urban explorers — prefer to walk along the sidewalk rather than in the middle of the road.) At no point was I asked for any ID, either by a policeman or by a security guard with nothing better to do than randomly stop people walking along a public street. I was not harrassed, bothered, or even spoken to (ironically) until I entered Calvary, when someone asked, “Is this Section 4?” Ooh. Dangerous. Look, I love and appreciate the area just like you do. But don’t try to paint it as some kind of Blade Runner-esque underworld where shady men who wish to do you harm lurk behind every corner. It’s just a bunch of warehouses. Don’t let your imagination run away with you. Jason’s experience has been different from mine. On bike rides through the area I have been harassed and threatened. Riding in a car through the area one sees several clusters of idle young men which anyone with some streetsense would avoid any contact with. It feels isolated. It is isolated.